Today The New York Times released one of the most moving interactive packages I have seen in a long time. “A Moment From the Boston Marathon, Audio and Stories” offers up the stories of the runners and spectators seen in one of the iconic images from the 2013 Boston Marathon. 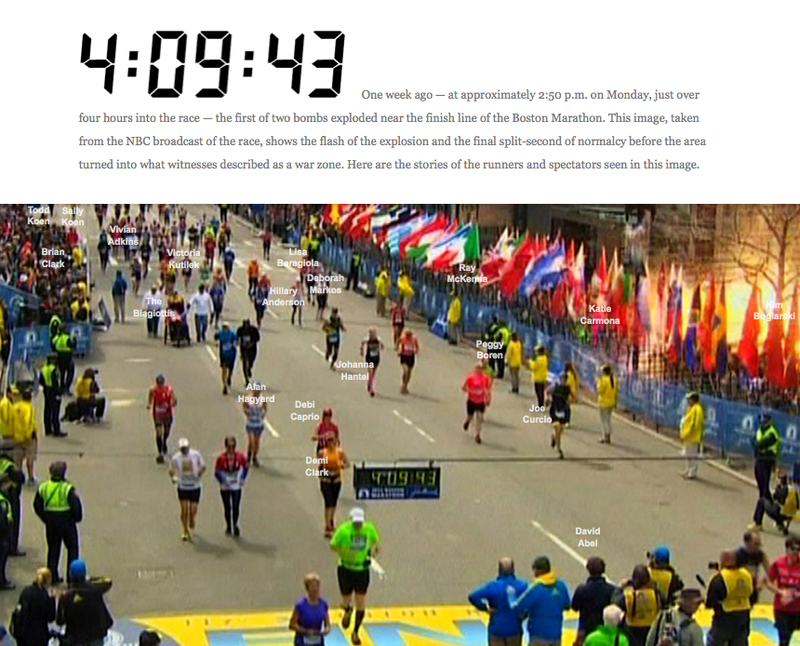 The picture, taken from the NBC broadcast of the race, shows the flash of the explosion and the final split-second of normalcy before the area turned into what witnesses described as a war zone. The image is now tagged with the names of many of the people pictured, and the names are linked to portraits and audio interviews with runners, event organizers and spectators. The package is elegantly designed and tells the story of the first moments of the attack with poise and emotion, providing insights like no other presentation I have seen to date. This entry was posted on Monday, April 22nd, 2013 at 10:02 pm and is filed under INFOGRAPHICS, PHOTOJOURNALISM. You can follow any responses to this entry through the RSS 2.0 feed. Both comments and pings are currently closed.